Becoming an owner of a company requires a lot to consider. Once you find a place to locate your business, then you need to think of all that decoration things do to. From flooring to window treatments and of course, the office furniture. Choosing the right furniture pieces is important. It affects the productivity and the entire appearance of your company. The reception area is the place where a lot of greeting and meeting will happen, so make sure you make this are as inviting as possible. The first impression is important as well as choosing the right reception counter desk. This piece of furniture is certainly one of the first things your clients will see when entering your building so here is how to choose the right one. When choosing a reception counter desk make sure the style will blend with the other furniture pieces and decor. Today's manufacturers and retailers offer a huge range of colours and materials to choose from, so buying the perfect fit is not a problem. For example, if there is a certain colour that represents your company you can incorporate it into your interior design so the desk will smoothly fit into space. For a more impressive look, you can add LED lights as an extra feature to the area. Once you decide on the design of your new reception desk the next thing to keep in mind is the available space. This will determine the size of the desk so it can perfectly fit without taking too much of the available space in the reception area. Also, if the desk is too small it can make the area look messy. Depending on how much space you have you can incorporate storage units for organizing the documentation. Location, where the desk will stand, is also an important consideration to make. When decorating a business building including the reception area, consider the requirements of your company. You may need more privacy and accessibility or you may need a surface needed for filling out some paperwork or a payment area. 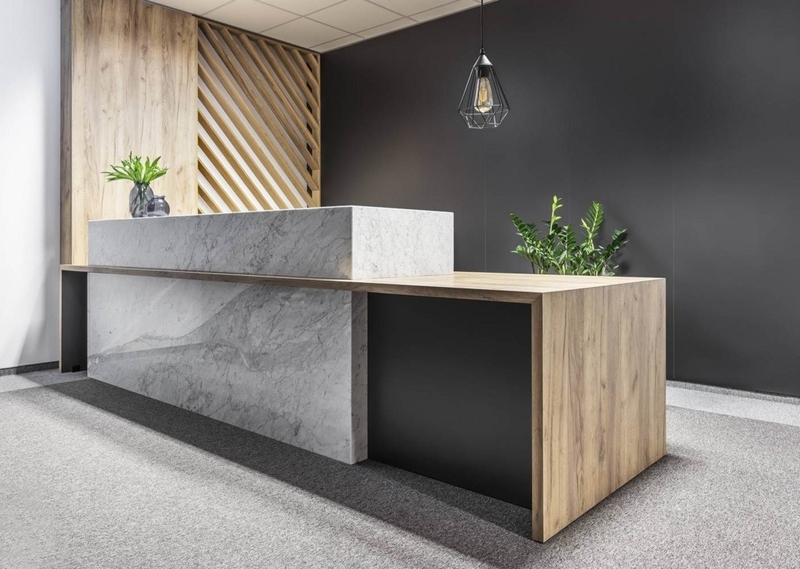 If you have enough room, then opt for a reception desk that will be big enough to accommodate all of these requirements so all your clients and customers can have an enjoyable experience anytime they come and visit your company. There is a certain colour that represents your company or you are about to choose it now? Blue has a calming effect and makes people more productive. Grey suggests creativity, authority and practicality. White colour for business can be refreshing and sterile while black is good for a background colour and creating a classic look. Green, as well as blue, is used to calm the nerves what makes these two colours prefered choice for hospitals and healthcare product advertising. Yellow represents happiness while orange stimulates the brain. Red is used to stimulate people to make fast decisions and brings images and text to the foreground.